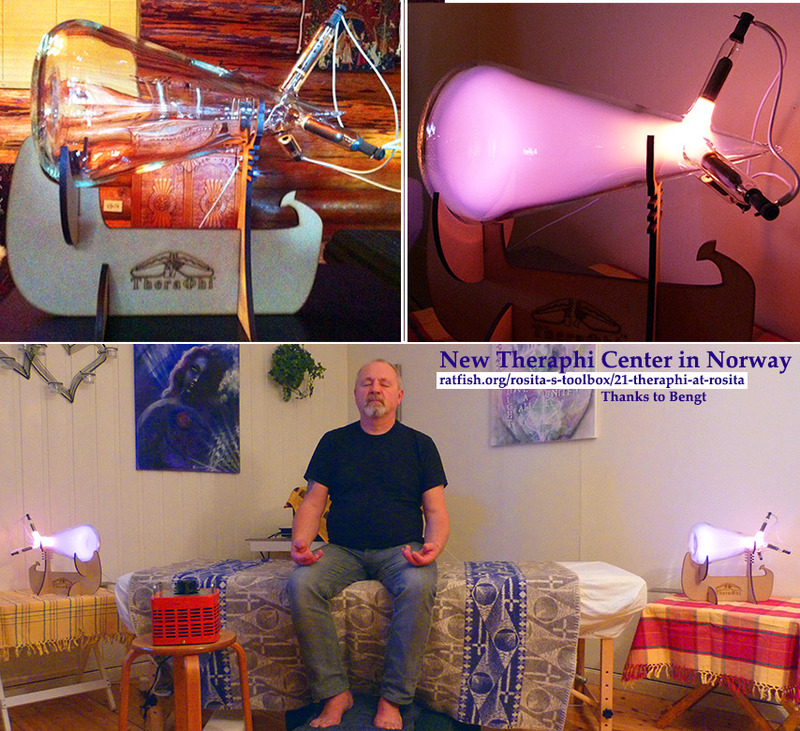 Theraphi™ may really be something with it’s amazing ways of using light frequencies, noble gases and harmonizing vortex-generated plasma fields. This to extents – earlier only known by some few people of this world – for many years – hidden away from the rest of humanity for reasons that may not be understood – not by anyone – except these few people and the ones removing it – from the knowing and understanding of humanity in general. We may also go in and help out verifying what has already been documented through French scientists and governmental officials during a period of more than 20 years – from the early 1960’s and up to 1983 – when someone clearly made certain – that this technology should be hidden away from humanity – until the day – someone could prove and also scientifically explain this amazing technology by math and physics to be re-created and made in proper scientific ways. Here at Rosita, up in northern Norway, we may use this technology in research and development – helping out verifying, proving and documenting within the subjects and sciences we may be best at. Thanks to Daniel Winter (Dan Winter) and Paul Harris and their efforts and hard work, Theraphi™ is fully understood and documented to function as given by the physics and scientific data revealed and provided by Dan Winter. Paul Harris is the one working with him to manually make the Theraphi™ and also the one that has proven it all to work as given by the physics and scientific data provided. Dan used his new discovery of the fractal / conjugate frequency signature of hydrogen to create Theraphi™ and Paul is the key expert of the Theraphi team – in electronics, plasma, and actual development of noble gas bioactive fields. Theraphi™ as shown, shared – and given to us all – is an initial hand made unit of this kind – to be used to create global initiatives by the ones seriously interested in documenting all what earlier have been proven and documented with the many years with the Prioré machine. From Theraphi™ units in Australia, USA (New York), France, South Africa (on Facebook) and some other places and countries – we now have a steady flow of verifying documentation and more incredible material coming in to be shared and used by all. So thanks to Dan Winter and Paul Harris for their many years of work and efforts – and to share this amazing and extraordinary invention and technology with all of mankind. In some of the countries with Theraphi™ there are medical doctors and other highly qualified scientists in and behind the use and process with documenting and verifying the astonishing results. Please feel free to investigate this with each and every country and place with Theraphi™ available through their official websites. (Much exciting material to read). It sure is exciting to know that “something” in this time we are now living – will make changes to the best for all of humanity – and this beautiful loving planet we are living upon!